As the Sri Lankan senior team were falling to a heavy defeat to Australia, Sri Lanka A completed a 202-run victory over Ireland Wolves at the Sinhalese Sports Club Ground in Sri Lanka. After winning the toss, the home side batted first and set about building a big total. Fernando’s innings of 139 runs from 118 balls included 10 fours and seven sixes – he has now hit 411 runs at an average of 102.75 in the last four matches against the Wolves. 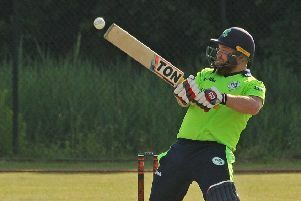 The Ireland Wolves spin attack led a middle-overs mission to restrict the scoring rate, led by Simi Singh (2-39) and James Cameron-Dow (1-40) bowling tightly during their full complement of 10 overs each. With Sri Lanka A at 251-6 with 10 overs to go, Angelo Perera (56* from 34 balls) and Kamindu Mendis (50* from 32 balls) smashed their way to a 102-run unbroken partnership, with the home side finishing on 353-6 after 50 overs. 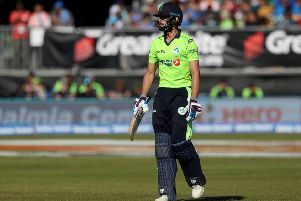 The Ireland Wolves response suffered from the loss of regular wickets, and despite six batters getting into double figures, no one could capitalise today and the visitors were dismissed for 151 in the 31st over. Speaking after the game, Ireland Wolves Head Coach Pete Johnston said: “We had a goal of building more pressure in the first 10 overs with the ball and not letting them settle into a rhythm. “I thought the guys who bowled in those overs did an excellent job of that and Harry [Tector] was smart rotating the bowlers in shorter spells which also worked well. “They then targeted us for the next period of 10 overs, but we pulled it back with Simi Singh and James Cameron-Dow doing especially well. It was really only the last five overs where they got away again. “While we have caught pretty well this trip, we missed a half-chance going into the last 10 which could have put the brakes on them and broken the partnership between Mendis and Perera. We took wickets again in the middle overs which was another positive.